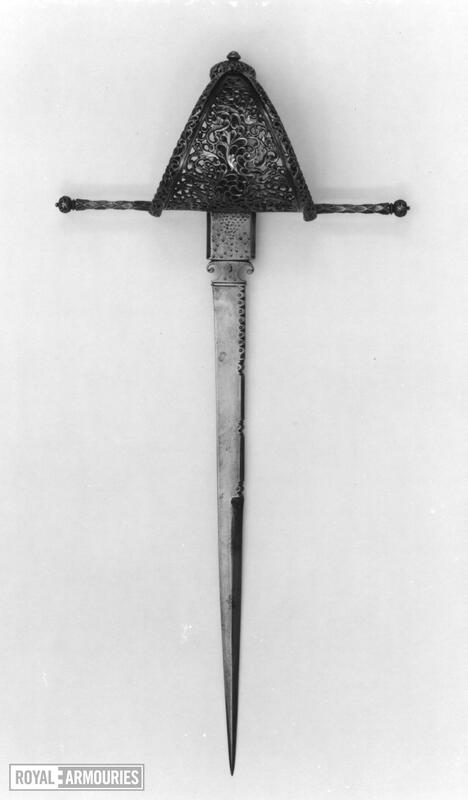 The entire hilt is of finely pierced and chiselled steel. 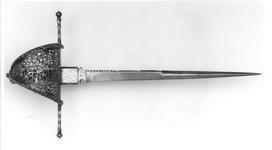 The quillons are straight and long, with a chiselled raised, overlapping leaf decoration running horizontally along their length, and with a button terminal, also decorated with pierced and chiselled foliage. 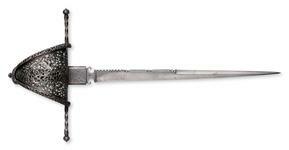 The hand guard is triangualr, curving over the knuckles from the quillons to the pommel and with turned over edges. The whole of the hand guard is decorated with pierced and chiselled foliage, and towards the base of the ricasso, a semi-circular cartouche containing a green man image. The grip is hollow and decorated similarly, but with an unpierced band at the top and bottom containing a raised leaf design similar to the quilons. 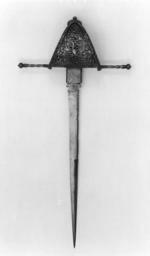 The pommel is hollow, pierced and chiselled with scrolling foliage, is ovoid in form and surmounted by a tang button with an engraved spiral design. 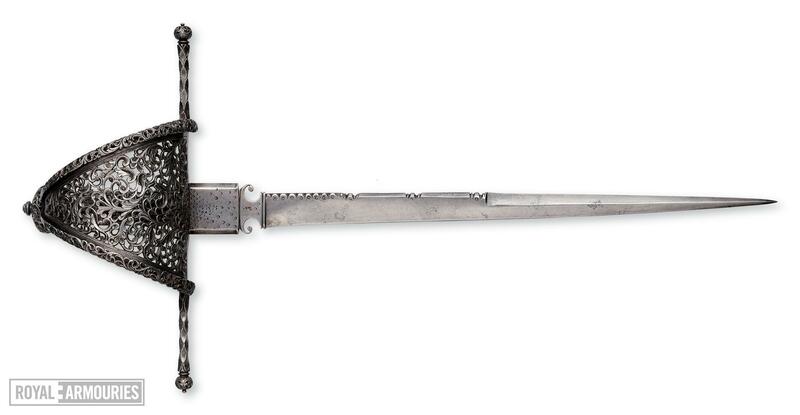 The blade is straight and divided into three sections, the first being a large ricasso with a punched flower motif and two small, C shaped sword catchers. There is a depression for the thumb on one side. A small maker's mark is stamped on both faces of the ricasso. The next section is single edged with a series of decorative ridges running along the back of the blade. There is a series of 8 small ridges directly next to one another, follwed by 3 larger ridges which boarder two kite sectioned lengths of the blade. 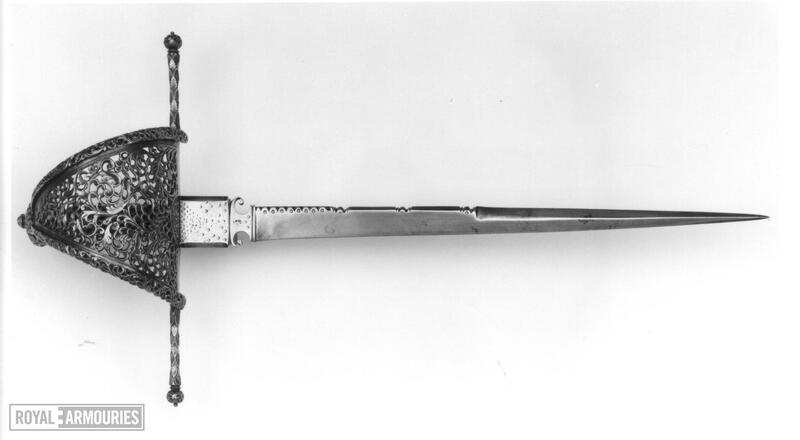 The final section of blade is of a diamond section and double edged. A V B Norman and G M Wilson, Treasures from the Tower of London, Norwich, 1982, pp. 61-2, no. 42 (illus.). Dorling Kindersley, Weapon. A visual history of arms & armour, Dorling Kindersley Ltd, London, 2006, p. 130 (col. illus., right).